Profitability ratio is used by the investor to measure and evaluate a company’s ability to generate income relative to its associated expenses during a particular period. The profitability ratios are most useful when compared to its competitor’s ratio or compared to the same ratio of previous years, which indicates that the company is performing well. Profitability ratio in short means that the amount of profit one can earn from its business with respect to its Equity, Assets or Sales. 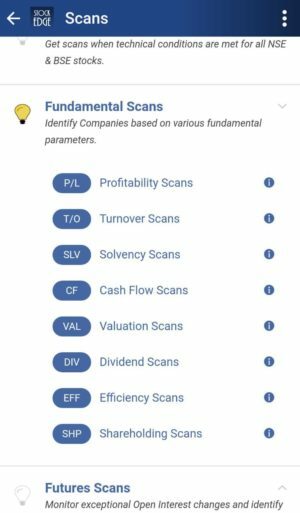 Profitability Ratio Scan helps you to filter out stocks having a continuous increase in profits. So let’s understand the Profitability Scans. 1. What do you mean by Return on equity? This ratio measures how much return the company is generating for its shareholders. It helps the owner (shareholders) understand how much the company is actually making from each rupee that they are investing in the company. A High ratio indicates that the company is generating good value for its shareholders. High Return on Equity means that the company is utilizing shareholders money wisely and thus generating profit. The higher the ratio, it means the management is efficient in utilizing its equity base and is thus giving a better return to its investors. Improved Return on Equity means that the company is increasing its ability to generate more profit. It also indicates how well the company is utilizing the shareholder’s fund. 2. What do you mean by Return on Capital Employed? This ratio computes the percentage of return the company earns on the funds invested in the business. Capital employed includes both owner capital (Shareholders fund) as well as outsider’s money (Debt). It measures the relationship between Earnings before interest & tax (EBIT) and capital employed. A high ratio represents that the company is utilizing its capital efficiently & thus generating value for its investors. Higher Return on Capital Employed means that the company is able to earn a return on all of the capital it employs. The company which shows RoCE more than its competitor is considered a better player. Improved Return on Capital Employed means company performing better than it was performing earlier and being able to generate income for its shareholders. It also indicates that the company’s growth rate is improved from past years. 3. What do you mean by Net Profit? Net Profit represents how much profit each rupee of sales generates. It provides the final outcome of how profitable a company is after all expenses including interest and taxes have been taken into account. A drawback of calculating this ratio is that it takes into account all types of income and expenses even if it is one time, which makes it difficult for comparison. Quarterly Net profit growth YOY means the company’s net profit for the quarter is being compared to the same quarter in the previous year. Growth in the same indicated that the company is able to maintain its market and is growing. Turnaround story YoY means a company which was incurring losses in previous years has generated profit in the current year. This shows that the company has acknowledged and identified its problem and developed and implemented a problem-solving strategy. 4. What do you mean by EBITDA? EBITDA stands for earnings before Depreciation and Amortisation, Interest, taxes. It represents the profit of the company before taking into account non-cash items like depreciation and amortization, as well as non-operating items like interest and taxes. The margin is easy to compare with other companies since it excludes expenses that may be volatile or somewhat differentiated. It can provide an investor, business owner or financial professional a clear view on a company’s operating profitability. The drawback of this margin is that it excludes debt when measuring the performance of a company. Quarterly EBITDA growth YoY means the company’s EBITDA for the quarter is being compared to the same quarter in the previous year. This shows the company is able to generate cash and is improving YoY to meet its expenses. 5. What do you mean by EPS? It is the portion of a company’s profit allocated to each share, net of taxes and preference dividend. It is a tool that investors or analyst use frequently to gauge the profitability of a company before buying its shares. The higher the EPS of a company, the better is its profitability. While calculating the EPS, it is advisable to use the weighted ratio, as the number of shares outstanding can change over time during the period. Consistently increasing Quarterly EPS means a company’s EPS for the quarter is being compared to the previous quarters. Consistently increase in EPS indicates that the company is able to generate profit after deducting all its expenses. Consistently decreasing Quarterly EPS means a company’s EPS for the quarter is being compared to the previous quarters. Consistently decrease in EPS indicates that the company is not able to generate profit after deducting all its expenses thus either the margins are less or the sales have dropped. Consistently increasing Annual EPS means a company’s EPS for the year is being compared to the previous years. Consistently increase in EPS indicates that the company is able to generate profit after deducting all its expenses. Consistently decreasing Annual EPS means a company’s EPS for the year is being compared to the previous years. Consistently decrease in EPS indicates that the company is not able to generate profit after deducting all its expenses thus either the margins are less or the sales have dropped. Profitability ratios show a company’s or business overall efficiency and performance. Ratios that shows Margin represents the company’s ability to translate sales into profit. Ratios that show growth represent a company’s ability to measure the overall efficiency of the company in generating a return for its shareholders. Thus to filter out companies having good profitability and growth in seconds subscribe to Stockedge. If you still do not have the StockEdge app, download it right now to use this feature. 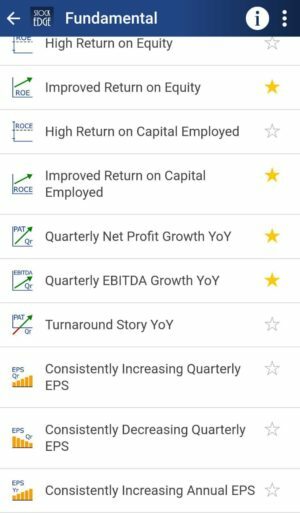 It is a part of the premium offering of StockEdge App.